Gibbons' Centra, Drumshanbo was an Excellence Ireland Supreme National Hygiene Award winner. It was an evening of well-deserved celebration and excitement for three Leitrim Centra stores as they were honoured at the 2018 Centra Quality Awards for excellence in the fields of hygiene and food safety within their businesses. Throughout the course of the event, which was held in the stunning Malton Hotel, Killarney, the Excellence Ireland Quality Association awarded a carefully-selected group of two Leitrim Centra stores with the Excellence Ireland Supreme National Hygiene Award – Q Mark; a prestigious nod to their continuous commitment to upholding exemplary standards of store hygiene and cleanliness. Each successful Centra store was chosen as a result of their ongoing hard work and dedication in these areas over the past three years, having displayed a clear awareness of the importance of providing the best service for their customers, as well as ensuring that quality, hygiene and food safety are continually prioritised by their team of staff. Baxter's Centra, Mohill won an Excellence Ireland Supreme National Hygiene Award. 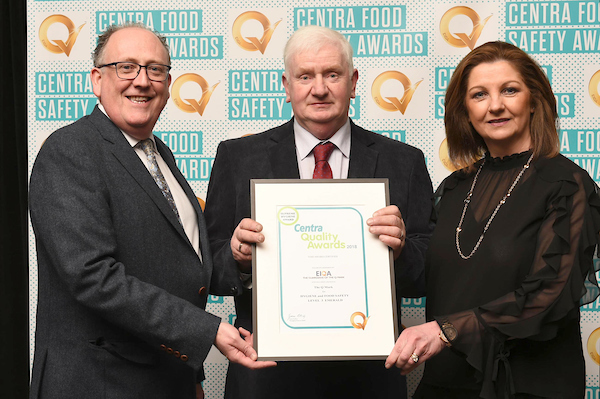 Aside from this reputable accolade, a further Leitrim Centra stores were also recognised during the event for their commitment to health and safety within the Irish food sector. These businesses were presented with the Excellence Ireland National Hygiene and Food Safety Certificate, which is another independent verification that the highest standards of operational hygiene and food safety are being met across the board by each of the selected convenience stores.